The real measure of a propulsion system's performance is when, installed in a vehicle and sized to a defined payload and mission, it is then compared to other propulsion systems. For the evaluation of the propulsion systems in this chapter the reference mission is an SSTO mission, launching into 200 km orbit with a 28.5-degree inclination and carrying a 7 metric ton payload with a carried net density of 2.83 lb/ft3 (100 kg/m3). The sizing was accomplished using the sizing program described in [Cyzsz and Vandenkerckhove, 2000] using the configurations in Figure 3.11. Hyper-golic propellants were carried for in-orbit maneuvering, corresponding to a AV of 490m/s that resulted in a weight ratio for in-orbit maneuvering of 1.1148. 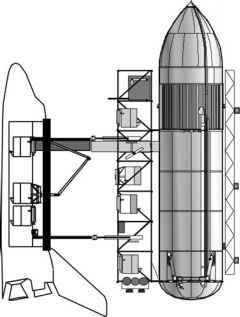 The orbital maneuvering propellant includes propellant to circularize the orbit and a retro-burn to deorbit the vehicle. All of the weight ratios presented in this chapter include the orbital maneuvering weight ratio of 1.1148, assumed constant for all propulsion systems. That is, a weight ratio of 8.1 for the all-rocket includes the 1.1148 weight ratio, so the actual weight ratio just to achieve orbital velocity is 7.2659. The sizing equations are given below. For details of the range of values, and the definition of the terms, see [Czysz and Vandenkerckhove, 2000]. The equations are solved simultaneously for the planform area and Kuchemann's tau; then the other vehicle characteristics can be determined for that specific solution. The approach was originally developed for application to ''Copper Canyon'' and the National Aerospace Plane programs. It was used in the Phase 1 screening of 32 high-speed civil transport concepts for the effort NASA sponsored with Douglas Aircraft Company. The solution was adapted to MathCad by a Parks College graduate student, Ignacio Guerrero, for use in the Senior Cap Stone Aerospace Design Course. Douglas Aircraft checked the solutions against a number of subsonic transports, and the author (PC) checked the solutions against the hypersonic aircraft concept of McDonnell Aircraft Advanced Engineering and the comparisons between this approach and specific converged design data were very close.